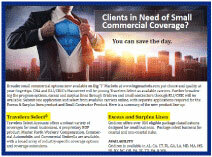 Travelers Select Accounts offers a robust variety of coverages for small businesses. A proprietary BOP product, Master Pac®, Workers' Compensation, Commercial Automobile, and Commercial Umbrella are available, with a broad array of industry-specific coverage options and coverage extensions. CNA Small Business currently offers a market for a broad variety of businesses, representing Healthcare, Financial Institutions, Professional Services, Business Services, Technology, Retail, Real Estate, Wholesalers and Manufacturing. BOP, Workers Compensation, Commercial Automobile, and Umbrella and Miscellaneous Professional Liability products are available. CNA is available in all states except AK & HI. RLI/CBIC offers a wide variety of accounts in the service, retail, light manufacturing, construction and hospitality sectors. Package & BOP products are available. RLI/CBIC available in AZ, CA, ID, ND, NM, NV, OR, & WA. Mono-Line General Liability available in all states. $2,500 Minimum premium. The above carriers, Including Travelers Select, are now submitted under the product name "Small Commercial Standard Markets" and ACORD Applications and 3 year loss runs will be required. Gridiron offers over 350 eligible package classifications designed for small business. Package select business for coastal and non-coastal risks. Gridiron available in AL, CA, CT, FL, GA, LA, MD, MA, MS, NJ, NY, NC, OR, PA, SC, TX, VA, & WA. To learn more or submit a risk for Gridiron, select Small Commercial Excess and Surplus Lines from the product menu. ACORD Applications and 3 year loss runs required. RLI/CBIC designed to meet the needs of small to medium-sized artisan and general contractors specializing in residential and light commercial projects. RLI/CBIC available in AZ, CA, ID, MT, ND, NM, NV, OR, TN, TX, WA, WY. 13 Additional states added first quarter of 2017. To learn more or submit a contractor's risk, select Small Contractors Market from the product menu. CBIC Contractor Application (located in Product Resources) and 3 year loss runs required. You will be able to submit one ACORD application and select from available standard carriers online, with separate applications required for the Excess & Surplus lines product and Small Contractor Product. The new markets are live as of today! 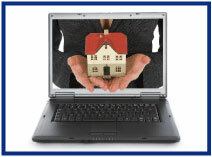 Join us for a webinar overview of AIG Private Client Group for affluent homeowners. We will run through the various coverage features in detail. We will also discuss tips on managing risks, claims, underwriting flexibility, premium credits, and coverage comparison. The presenter is Lisa Gelles, Business Development Manager - AIG Private Client Group. Click here to download and check out our small commercial overview sheet, which provides a handy summary of the broadened small commercial offerings. Why not print a copy and hand it to your commercial producers now? For more in-depth coverage details, please visit Big "I" Markets and click on the "Underwriting and Coverage" pages. Please contact Tom Spires with any questions about this product at tom.spires@iiaba.net. You can catch up today by accessing recordings of part one and part two online. Recently I was distracted by an advertisement on my Skype screen to obtain information related to insurance. Naturally, I clicked on it and I ended up at the Web site shown below. With the array of insurer logos circled below in red, I was intrigued. The reason I was intrigued is that the logos are from insurers that represent different distribution strategies. I asked myself, "How could one entity have all these agency appointments?" 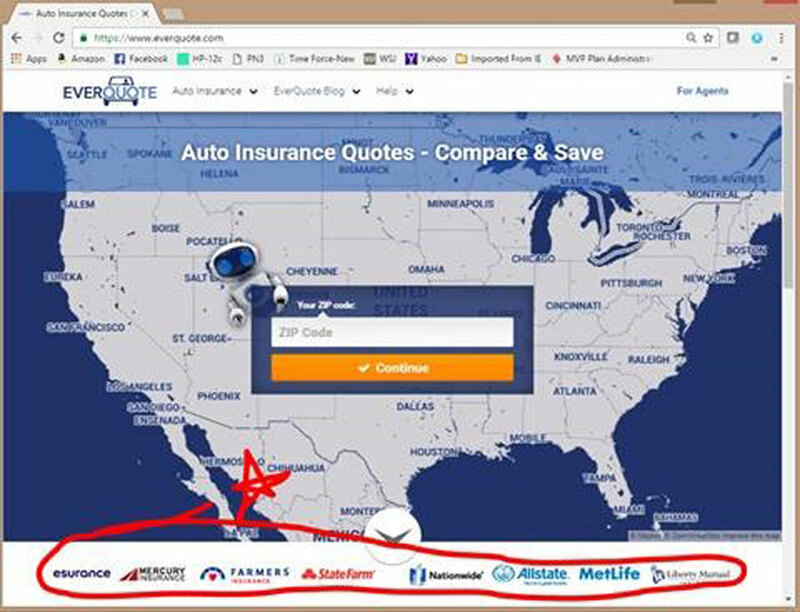 It appears that the owner of the website is an aggregator of insurance leads. They are also a licensed agent in several states I checked. I did not see that Everquote was an appointed agent of any insurers in the two states I checked. These brings me to the point of this week's Student of the Industry: Be very careful with insurer logo use. Beyond the practical desire to not surprise any insurer that you used their logo, as agents you should be aware that licensing considerations and unfair trade practices are a major consideration. Insurance regulators want to know which agents can bind the insurers into contracts, pay claims on the insurer's behalf, etc. Use of logos infers such authority. Insurance departments are also interested that the insurers who have agents in the field properly register them and pay the proper fees. So, as students of the industry in marketing your agency, be very careful with your use of any insurer logos. You should know your state regulations on what's required in addition to just showing the logo. If in doubt, always ask the insurers you have access to or the intermediary that makes that access available to you. Congratulations to this week's winners - Tawni Gama (WA), Mary Catherine Shaver (LA), Judy Brennen (IL), Morgan Ellis (PA) & Gabe Mudd (TN). Congratulations to our agent in Illinois on a vacant dwelling - non-standard sale of $11,120 in premium!